A research was conducted among 686 patients of HIV/AIDS, who are proved with positive ELISA test and Western BLOT test. Out of these 686 patients 83.1%, were suffering from full blown AIDS, 16.9% were HIV seropositive. Number of males and females affected with seroposdive and AIDS with different age groups were recorded. Detailed clinical examination of oral cavity was carried out for all the patients to find out the various classical oral manifestations of HIV/AIDS and the observations were recorded. 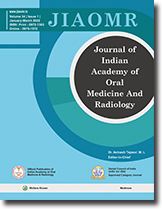 A total number of 15 different oral mucosal lesions were recorded among Indian population in the research. The study has proved that oral manifestations of AIDS occurred in 86% HIV/AIDS patients. Research findings were recorded with classical oral mucosal lesions of HIV/AIDS. This is a clinical research on HIV/AIDS patients. Background and Objectives: Thaaassemia has been reported as a high prevalence genetic disorder with some oromaxillofacial complications. The aim of this study was to evaluate the prevalence of oromaxillofacial disorders in thalassemia patients and to detect the presence of any correlation between the orofacial manifestations and the hematological picture/systemic findings. Materials and Methods: A total of 50 thalassemic, 36 with thalassemia major and 14 with thalassemia minor were selected from the hematology Department of Lokmanya Tilak Medical College and Government (LTMG) Hospital, Sion, Mumbai. Results: The most prominent features included. skull bossing seen in 74% of the patients hypertelorism, depressed bridge of the nose, prominent malar bones, pallor of oral mucosa, gingival pigmentation and proclination of teeth. Splenomegaly, hepatomegaly and cardiovascular changes were also commonly seen. The blood picture showed for a low mean Hb value of 6.63 gm/dl. Microcytosis, anisocytosis, hypochromasia and poikilocytosis was seen in the blood smear. Hemoglobin electrophoresis patterns revealed raise HbF and HbA2 levels. Conclusions: This study showed that about 84% (42 cases) of all patients under consideration showed changes in oral and maxillofacial complications including upper and lower jaw protrusion. Saddle nose, space between anterior teeth, anterior teeth protrusion and frontal bossing. It was noted that the severity of orofacial manifestations increased with a decline in the systemic health and a deterioration in the blood picture. Also, it was revealed that the rate of prevalence for oral and maxillofacial complications decreases when patients receive blood at younger ages. Denture stomatitis is a prevalent and longstanding problem in complete denture wearers. Post denture placement produces significant changes in the oral environment that may have an adverse effect on the integrity of the oral tissues. Mucosal changes could result from a mechanical irritation by the dentures, traumatic occlusion an accumulation of microbial plaque, fungal infection or, a toxic or allergic reaction to components of the denture material. In the present article, various etiological factors contributing to the denture stomatitis and its treatment are reviewed. Photochemotherapy (PUVA) has become a useful alternative in dermatologic therapy. Start from historical date up to modern era the safe and useful modes of PUVA has been documented in many immunological disorder. Despite side effect and potential long-term hazards photochemotherapy shown in clinical routine as an effective alternative to conventional immunosuppressive therapy. A wide range of diverse field for its possible utility provides an alternative armamentarium in many immunological disorder for dermatologist and also for oral diagnostician. The common procedure for detecting potentially malignant (PMOL) or malignant oral lesions consists of visual inspection, followed by biopsy of any suspicious lesions found. However, the processing of biopsy material and the interpretation of the results inevitably leads to diagnostic delay and the added possibility of taking an unrepresentative sample. Therefore, techniques that can distinguish between benign from malignant types in a reliable and noninvasive way would be very useful. This review provides an overview of the literature how spectroscopic techniques are useful and can provide tissue diagnosis in real-time, noninvasively and in situ. Key message: Spectroscopic techniques can provide tissue diagnosis in real-time, non-invasively and in situ. Oral cancer is a potentially fatal disease that has been the bane of clinicians throughout the world. Though various modalities of management exist, early detection still provides the best hope for any cancer patient Advances in molecular diagnosis have led to a plethora of choices being available in the fight against cancer. Abnormal cellular products elucidated from malignant cells can be detected and measured in various body tissues and fluids and constitute tumor markers. The various clinical applications and their limitations are covered in the brief overview to help the oral medicine specialist understand the relevant advances made in the field of tumor markers. Gardners syndrome (familial polyposis coli) is a genetic condition characterized by colonic polyps that carry a 100% risk of malignancy if untreated. Early diagnosis, in which an astute and knowledgeable dentist can play an essential role, is therefore of paramount importance. The presence of osteomas and multiple unerupted teeth provides the dentist with a major pointer to the possible presence of this disease, which may be provisionally diagnosed on the detection of other obvious features, like the cutaneous lesions. This fact is clearly illustrated by the accompanying case report of Gardners syndrome in a middle aged female patient who presented with the typical dental manifestations of the syndrome and timely detection of other manifestations halted the dreaded disease from further progression. Oral lichen planus (OLP) is a chronic inflammatory mucocutaneous disease that frequently involves the oral mucosa. It has been regarded by many authors as a premalignant condition. There has been a continuous debate regarding the possible malignant potential of OLP, and these patients have been recommended to have their lesions monitored two to four times annually. A case of a lichen planus transformed into malignancy is reported here. This case does not provide answers to the ongoing controversy about the innate propensity of OLP to become malignant. However, in view of common occurrence of OLP and unresolved issue regarding its malignant potential (MP), thus case report illustrates the need for histologic confirmation and close follow-up of patients with clinical lesions that have lichenoid features. Nasolabial cyst is an uncommon nonodontogenic, developmental cyst, originating in maxillofacial soft tissues characterised by its extraosseous location in nasal alar region. This cyst is frequently asymptomatic with most usual sign being alar nose elevation. Its frequency is around 0.7% of cysts of the jaws and 2.5% of the nonodontogenic cyst. A case report of a nasolabial cyst for which a radiographic contrast medium was used in order to localise the lesion is discussed. This article documents the presentation and management of nasolabial cyst in a 50-year-old woman and discusses the considerations related to the diagnosis. Osteoid osteoma is a benign tumor of the bone which has seldom been described in the jaws. It was first described as a distinct clinical entity by Jaffe in 1935. Lichtenstein defined osteoid osteoma as a "small, oval or roundish tumor like nidus which is composed of osteoid and trabeculae of newly formed bone deposited within a substratum of highly vascularized osteogenic connective tissue". The most interesting clinical feature of osteoid osteoma is the exquisite pain produced by a very small lesion, never greater than one centimeter in diameter. It accounts for 3% of all primary bone tumors, and about 10% of benign bone tumors. About 80% of cases of osteoid osteoma occur in long bones, while less than 1 % occur in jaws. We report a case of an 18-year-old male patient with osteoid osteoma of right side of the mandible. Rhinoliths are calcareous concretions around calcinated intranasal foreign bodies within the nasal cavity. They are commonly seen in the anterior part of the nasal cavity and are diagnosed based on history and presenting illness. Developing lesions are usually asymptomatic and can be a supplementary finding during routine radiography. We report a case of rhinolith, found incidentally in a dental radiograph. Schwannoma (neurilemmoma) is a benign neoplasm originated from the neural sheath and occurring most frequently in maxillofacial region. Intraosseous schwannomas are rare. The mandible is the most common site of occurrence for these lesions. We report a rare case of Intraosseous neurilemmoma of the mandible, with an emphasis on clinical, radiographic and pathological findings. The tumor located mainly in the ramus region, presented as a soft tissue mass in the oral cavity. Multilocular, well-defined, and radiolucent lesion on plain radiography. Dilatation of the mandibular canal was identified. Plain radiography partly helped to identify the solid nature of the tumor. A biopsy was necessary to make the final diagnosis because of the relatively nonspecific nature of the lesion. The lesion was surgically removed and no evidence of recurrence was observed after 6 months. Parotid gland or duct injury can be caused by assault with a knife, bottle, or more rarely gunshot. Post-traumatic parotid gland and duct injuries are not common. The low rate of occurence of parotid injury may account for the missed diagnosis of parotid and duct injury on admission and, after a varying period sialoceles or fistula. This report describes a case of a post-traumatic sialocele of parotid gland. A review of the literature and description of the medical and surgical management options for these injuries are also provided. Laband syndrome (LS) is a rare autosomal dominant inherited disorder characterized by coarse facial appearance, gingival fibromatosis, and hypoplasia of the terminal phalanges and nails of hands and feet. Additionally, more variable features include hyperextensibility of joints, hepatosplenomegaly, mild hirsutism, and mental retardation. This paper reports a case study of 22-year-old male exhibiting symptoms of Laband syndrome, including cardiac involvement described only in one other case. Detection and timely recognition of such syndrome associated with gingival fibromatosis allows adequate dental care and cardiac evaluation at periodic intervals is merited to prevent complications and improve the overall quality of life for these patients. Dental practitioners should be alert for developmental abnormalities that may occur in patients with gingival fibromatosis as this may indicate the presence of a rare disorder like Zimmermann-Laband syndrome. A comprehensive medical history and physical systemic evaluation are essential for correct diagnosis, treatment and prevention of cardiovascular complications in future in these patients.